All People’s Congress Party President Nason Msoni has urged President Edgar Lungu to rise above partisan politics and stop his premature 2021 campaigns saying it is distracting the nation. 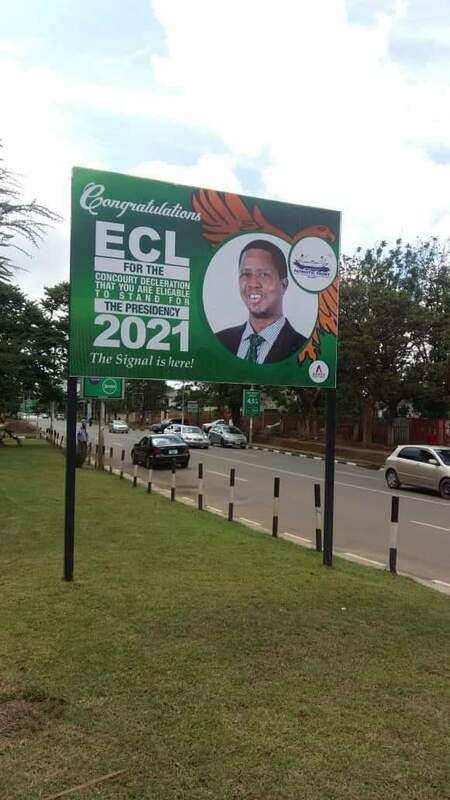 Commenting on some billboards written “ECL 2021” (Edgar Lungu for 2021 elections) seen around Lusaka, Msoni said the campaign billboards are a distraction not only to the public but to him as everyone will prematurely go into a campaign mood. He advised the President to deliver what he promised to the voters who put him in the office as opposed to using public money to launch premature campaigns. “The posters (billboards) littered around the country saying ECL 2021 are a distraction even to himself and it is a clear misuse of public funds. It is clear that it is public funds at play but we urge him that he promised Zambians to deliver deliverables. From our stand point of view this President has been campaigning since 2015 up to now, so clearly this is not about our people, this is about him and his friends,” he said. Msoni noted that it does not make sense that an incumbent was launching a campaign long before the campaign period when he should be delivering on his promises. “It doesn’t make sense to kick start a premature campaign now when we still have so many years ahead to 2021. This is going to distract everybody. It means that the country is going to be in a campaign mood, premature campaign mood. “We think that this type of conduct is most unfortunate especially for an incumbent President. It is fine for the opposition to sell themselves but for him as a person in office, he must demonstrate that he is commanding leadership, that he is providing what he promised. We think that he has failed to live up to to his promises,” Msoni said.